Q. The skin under my eyes is getting so wrinkly. What can I use? A. Retinol. It is a great ingredient for reducing wrinkles. It can't get rid of them, but it can lessen them. Retinol is a vitamin A derivative. It's is found in prescription skin care creams such as Retin A and Renova. It is also found in non prescription skin care cream in a lower concentration. Retinol increases cell turn over and stimulates the production of collagen and elastin in the skin making the skin younger and firmer looking. Retinyl acetate, retinyl palmitate, retinaldehyde, retinyl aldehyde, and retinal are some of the form of retinol used in anti aging creams. Look for an eye cream containing retinol that is in a tube or a pump bottle instead of a jar. Retinol loses it's strength when exposed to air. You can also use an eye serum before you apply your eye cream for a double shot of wrinkle fighting retinol. A serum is a thinner liquid than a cream. A serum quickly penetrates the skin. It is more of a treatment than a moisturizer so a moisturizing eye cream goes on top. Retinol can be irritating. Look for retinol palmitate and retinol linoeate on the ingredient list if you are sensitive. Use your retinol eye cream everyday unless you are sensitive. If you are sensitive and get irritated, try using it every 2-3 days. It is a good idea to use a soothing nourishing eye cream on the days when you are not using the retinol cream to keep the eye area hydrated. Click here to shop for Dennis Gross eye cream. Click here to shop for Murad Eye Cream. Have a Younger Looking, Beautiful Day! Get more skin care tips on youtube! If you have trouble with your nails breaking, try having them shaped "squoval". It is combination of square and oval. The nails break less in this shape because the sides of the nails are not filed into as in an oval and there are no sharp corners to catch and break off as in a square shape. Fix your broken eye shadow! Love this OPI nail color from the Brazil Collection. Toucan Do It if you Try! I can't usually wear orange, but this one works for me. It will look beautiful on my toes this summer. It looks fabulous with a little gold shimmer on top too! 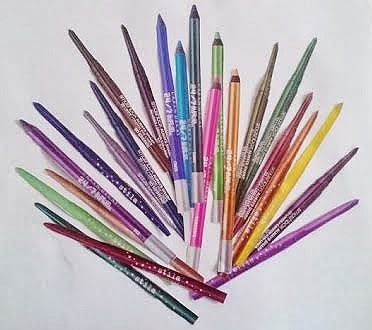 Look at the gorgeous rainbow of eyeliner colors! Colored eyeliner has been all the rage for the past couple years. Now it's hotter than ever with so many beautiful colors to choose from. Use it to create a colorful cat eye or smudge it for a colorful smokey eye. Look for bold color for prom this spring! Lips are bold shades of orange, berry and red. Eye shadow is metallic gold, cobalt, smoked lilac or a wash of white or pale pink. 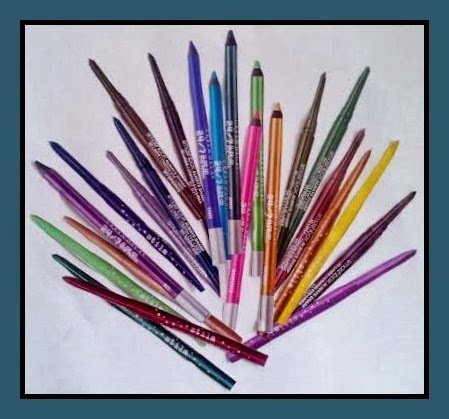 Try a colored eye liner in navy blue, cobalt or a metallic. Add a little upturned cat eye to the outer corner. Lashes get a nice dose of black mascara and can have a spiky Twiggy effect. Cheeks are dewy pink or berry with a touch of luminizer to give a fresh healthy glow. OPI has come out with a new Muppets Collection to coincide with the new Disney Muppets Most Wanted movie. If you like sparkle and glitz, you will love this collection! This collection will be released March 2014. Here is a list of a few hydrating serums that contain aloe to soothe your dry winter skin. A serum is a treatment for your skin and works well alone or under your moisturizer. Aloe Barbadensis Gel, Water, Pentylene Glycol, Glycine Soja (Soybean) Oil, Cyclomethicone, Glycerin, Butylene Glycol, Dimethicone, Alpha-Glucan Oligosaccharide, Caprylyl Glycol, Acrylates/C10-30 Alkyl Acrylate Crosspolymer, Panthenol, Hydroxyethylcellulose, Lanolin, Polysilicone-11, Sodium Hydroxide, Bisabolol, Lecithin, Disodium EDTA, Tocopherol, Avena Sativa (Oat) Bran Extract. Aloe Barbadensis Leaf Juice(1), Sea Silt Extract, Glycerin, Aqua (Water), Dehydroxanthan Gum , Avena Sativa (Oat) Kernel Extract(1), Secale Cereale (Rye) Seed Extract(1), Tapioca Starch(1), Aurantium Dulcis (Orange) Peel Oil, Cedrus Atlantica Bark Oil, Citrus Limon (Lemon) Peel Oil, Copaifera Officinalis (Balsam Copaiba) Resin, Coriandrum Sativum (Coriander) Fruit Oil, Geranium Maculatum Oil, Lavandula Angustifolia (Lavender) Oil, Pogostemon Cabin (Patchouli) Oil, Rosmarinus Officinalis (Rosemary) Leaf Oil , Styrax Benzoin Resin Extract, Camellia Sinensis Leaf Extract(1), Chondrus Crispus (Carrageenan) Extract(1), Glycine Soja (Soybean) Seed Extract(1), Panax Ginseng Root Extract(1), Alcohol(1), Benzyl Alcohol, Potassium Sorbate, Limonene, Linalool. The colors we wear represent moods and emotions. It is known as color psychology. Red is known as the color of love. It is stimulating, energizing, passionate and romantic. It quickens the pulse and stimulates the senses. 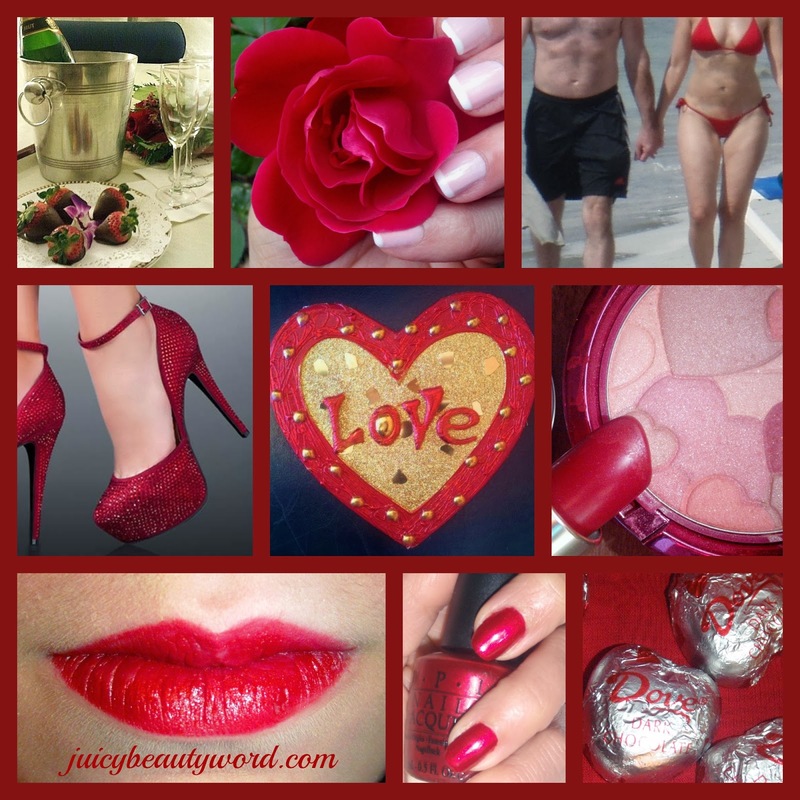 Men are attracted to women wearing red! Red is the color of good luck in eastern cultures. It can stimulate the appetite. The bold exciting color of red commands attention and gives a feeling of strength. You don't have to spend a lot of money on a lipstick in a color you don't usually wear. Just stop into your local drug store or super store and pick up some Wet n Wild lipstick for about $3.00. Need a lift this cold, cold winter? Add some color to your cheeks with Physicians Formula Happy Booster Glow & Mood Boosting Blush. This blush has the light sweet fragrance of violet, contains mood elevating plant extracts and comes in rose, pink, warm and natural. 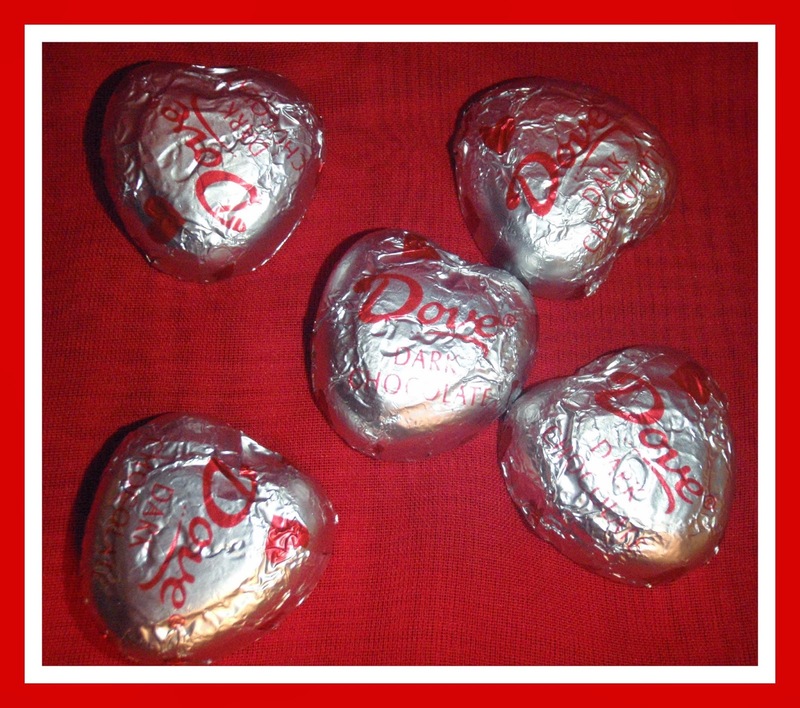 I just love the happy hearts printed on it! I tried the rose. It is a nice clear color and has a soft reflective finish. The more you apply, the more the color builds. Looks like a great little Valentine gift, too. $11.95 at drugstores and it is not tested on animals. Here is a link to check it out. the chocolate, the higher the cocoa content. So chocolate is actually good for you! has patented a process called "Cocoapro". more of its healthy cocoa flavonoids. Feeling under the weather? Take an warm Epsom salt bath at the first sign of illness to dilate the blood vessels and boost circulation, decrease cold and flu symptoms and promote quicker healing. Epsom Salt, which is Magnesium Sulfate, eases muscle aches, detoxifies the body and actually raises white blood cell counts. 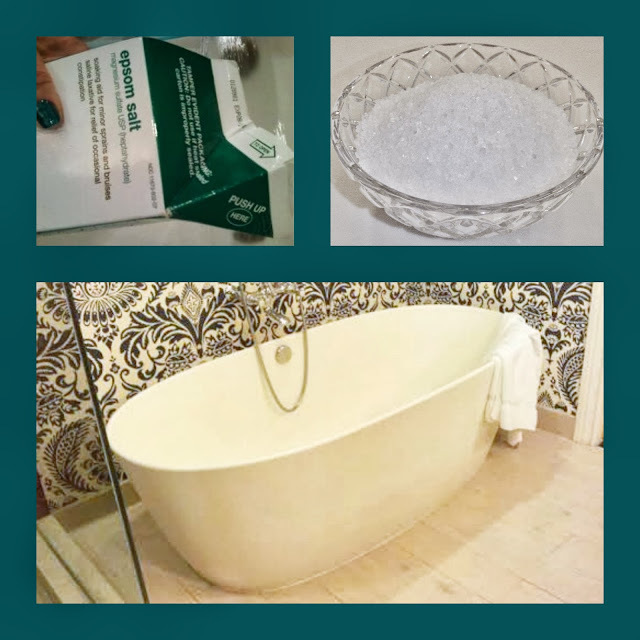 Epsom Salt is easy to find in your local drugstore or superstore. Dissolve 2 cups of Epsom Salt in a warm bath. Relax and soak for 20 minutes. How often should I wash my dry skin? Q. My face is so dry this winter. Should I still wash it in the morning and at night? A. You can if you are using a moisturizing facial cleanser. Wash your face at night with a moisturizing facial cleanser, not a soap, to remove dirt and makeup. Pat dry, apply toner and moisturizer. In the morning, you can use the moisturizing facial cleanser or you can just splash your face with warm water, pat dry, apply a toner formulated for dry skin, then finish with a moisturizer. Want shinier hair? Eat yogurt! Researchers at the Massachusetts Institute of Technology, doing a study on probiotic yogurt and digestive health, found that the animals they were studying developed very shiny hair. 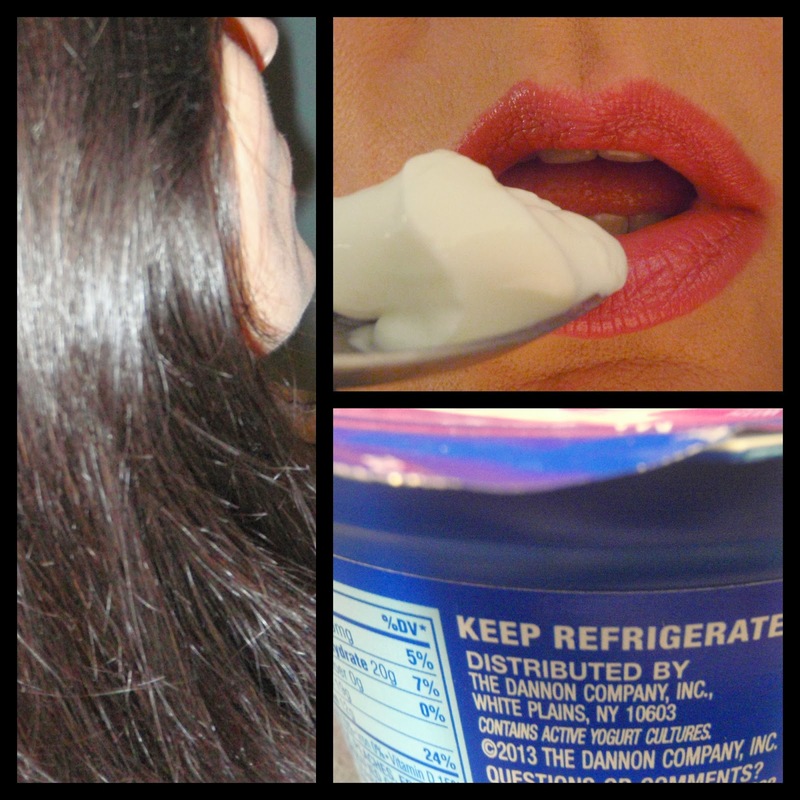 The probiotic causes changes in the immune system and hormones that affect hair and skin. The scientists feel there would be a similar effect in people. A healthy diet will help your body make healthy hair. Protein Soy protein encourages hair growth. Eat soybeans. Zinc Zinc helps to reduce dandruff and is needed to repair our cells. Eat peanuts, cashews, almonds, pecans, pumpkin seeds, sesame seeds, wheat germ, chick peas and peas. Finish with it off with a little dark chocolate! Omega 3 Fatty Acids Omega 3 conditions the scalp. Eat soybeans, walnuts, flax seeds and salmon. Omega 6 Fatty Acids Omega 6 adds strength and shine to the hair. It also helps to fight dandruff. Eat cereals and grains, oils: flax seed, soybean, corn, sunflower, cottonseed, black currant and evening primrose and egg yolks. B Vitamins B Vitamins, especially biotin, reduce hair loss and hair breakage. They improve hair strength and aid in the production of oil by the oil glands which conditions the scalp and hair. Biotin also prevents premature graying! Eat leafy green veggies, carrots, cucumbers, tomatoes, avocados, cabbage, onions, cauliflower, chick peas, kidney beans, nuts, bananas, berries, wheat germ, yeast breads, egg yolks, cheese, yogurt and halibut. Vitamin C Vitamin C also allows the oil glands to make oil to condition the scalp and hair. Eat citrus fruits, strawberries, kiwi fruit, papayas, guavas, cantaloupe, tomatoes, bell peppers, dark leafy greens, broccoli, brussels sprouts, cauliflower fresh thyme and parsley. Vitamin A Helps to prevent hair loss. Eat apricots, cantaloupe, carrots, sweet potatoes, pumpkin, butternut squash, dark leafy greens, paprika, cayenne, chili powder, red pepper powder, dried herbs: parsley, basil, marjoram, dill and oregano and egg yolks. Silica Silica is a mineral that helps to slow down hair loss and adds strength and shine to the hair. Eat bananas, strawberries, raisins, beets, celery, peppers, potatoes, green beans, carrots, cucumbers asparagus, cabbage, onions, oats, brown rice, bran cereal. Copper Copper helps hair retain it's pigment. Eat mushrooms, seeds: sesame, pumpkin and sunflower, nuts: cashews, hazel, brazil, walnuts and dried basil. Add a little dark chocolate! This winter is just dragging on! I am looking forward to some fresh pastel nail colors for spring. An ingrown eyelash can be very painful. 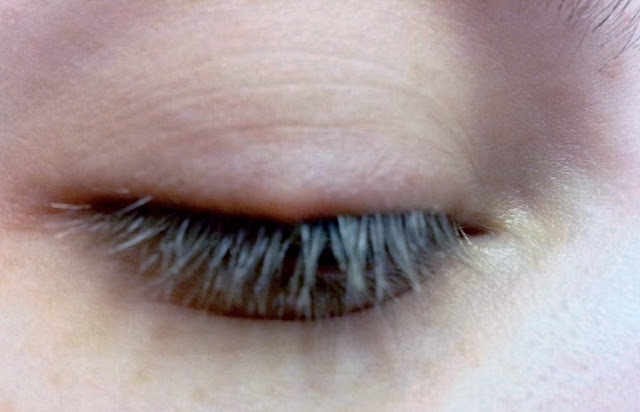 The lash grows into the skin instead of growing outward. The technical name is Trichiasis. The ingrown lash causes a red bump on the lash line that can be itchy and painful. The inflamed bump can develop a pimple like infection and may feel like there is something in the eye. It can also cause some swelling on the whole eye lid. It is important to address the problem quickly since an infection around the eye can spread and turn into serious problem. See your eye doctor for treatment. The doctor will free the hair and treat the infection, usually with an antibiotic. Permanent removal of the lash may be in order if the lash frequently gets ingrown. This can be done with electrolysis or cryotherapy. Electrolysis uses an electric current to destroy the hair. Cryotherapy destroys the hair follicle by freezing with liquid nitrogen. Ease the pain and irritation with a warm wash cloth. Gently hold a clean very warm wash on the area that has the ingrown lash. Repeat frequently though out the day. Try cotton baby wash cloths. They are soft and gentle. See my Amazon picks at the bottom of this post for purchasing organic cotton baby wash cloths. The wash cloth may also be used to help free an ingrown lash. Gently rub a warm clean wash cloth back and forth over the ingrown lash. The wash cloth will gently exfoliate possibly releasing the ingrown lash. Do not do this if you have the pimple like infection, because you can spread bacteria to the surrounding areas of your eye. A doctor is definitely in order in there is any infection! Use a green tea bag as a compress. Wet the tea bag with warm water and place it on the eye with the ingrown lash for about 15 minutes twice a day. The tannin in the tea will help reduce swelling and inflammation. Use cucumber slices on the eyes to reduce inflammation, swelling and promote healing for about 15 minutes twice a day. Use artificial tears to ease the discomfort and keep the lash line moist. Softened moist skin allows an ingrown hair break through the surface of the skin easier than tougher dry skin. Moist skin also heals quicker. If you can see the hair poking through the skin, close your eyes and have someone with a steady hand carefully tweeze the hair out. Reduce the chance of getting an ingrown eyelash by removing eye makeup thoroughly at night with an effective eye makeup remover. Use a wash cloth to gently rub back and forth on the lash line daily to help reduce build up of dead cells that can trap hairs under the skin. Apply coconut oil for it's hydrating, anti bacterial and anti inflammatory properties. Use a cotton swab to apply a very thin layer of coconut oil to the lash line at night to hydrate and help keep the lash line soft to make it easier for the lashes to come through the surface of the skin as they grow. Hope this helps you with those annoying and painful ingrown eyelashes. Have a Healthy, Beautiful Day!